Do you find yourself daydreaming of a cruise to a tropical island or a weekend retreat in the mountains? Of course, this is a fantasy because you are so busy that taking a bubble bath by candlelight seems like a decadent indulgence! Sigh. Let’s be honest, there is no busy like teacher-busy. In life, everyone has busy seasons, but as a teacher, busy seasons can feel like impossible, crushing seasons if we're not incredibly intentional with our time and energy. There are so many balls to juggle - or shall we call them china plates instead? There is your personal life, family life, devotional life, social life, and who could forget your teacher life! 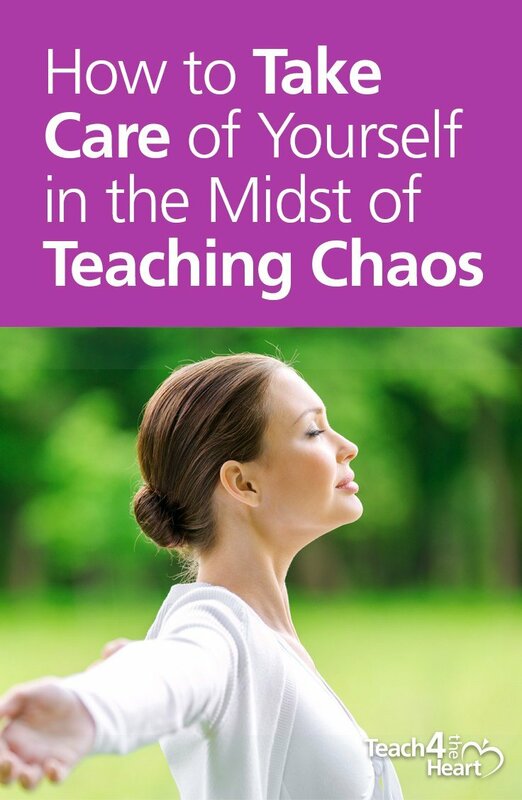 Of course, your teacher life alone involves many facets such as coworker, parent and student relationships, lesson planning, grading, observations, extracurricular activities and all sorts of miscellaneous duties. Throw in a few a holidays, unexpected health issues, family challenges or extra work deadlines in addition to volunteer commitments, and you might find yourself in meltdown-mode if you don’t apply some basic self-care principles. Fear not! There are solutions that can keep an intensely busy season from turning into a drowning season! Let’s learn how to care for our spirit, soul and body no matter what else is happening in our life! During busy seasons, it is tempting to neglect feeding our spirit until we realize that feeding our spirit keeps us afloat during the busy seasons of life. So why is spending time with God so hard sometimes? Carving out devotional time is challenging because zillions of “urgent” things often distract us from the quiet--yet deeply important matters of life. Unlike teaching, there are no pressing deadlines for reading scripture! Your pastor will probably not beat your door down if you miss a few church services. You are also not required by anyone to track your prayer minutes like you track student data-thank goodness. However, the seemingly non-urgent nature of our devotional life can deceive us into thinking it is okay to put our relationship with God on the back-burner--at least until life slows down--but it never quite works that way does it? One day of missed time with God can easily turn into several weeks before we realize it. Suddenly we feel far from God and spiritually dry. We may even feel like we are starting over from scratch in our walk with God over and over again. What’s worse is that the enemy of our soul LOVES when we don’t care for ourselves spiritually because as Proverbs 4:23 says, everything we do flows from internal, invisible, inward realities. The busy-season-dilemma is that we have reduced time and energy, and something has to get cut because we can’t do it all. With God’s help, we must decide that the thing we cut will never be our time with God. To cut our time with God is to cut off our source of life, energy and joy! Although it often feels counter-intuitive, we must spend time with God in order to be able to accomplish the long list of things we need to do. Martin Luther (the legendary Protestant reformer) said, "I have so much to do today that I'm going to need to spend three hours in prayer in order to be able to get it all done." Of course, I am definitely not saying you need to spend 3 hours in prayer, but our friend Martin Luther was on to something, and with God’s help he was a world changer and a history maker! Our time with God is the gas that keeps our car going! If we don’t refuel we will end up stranded on the highway of life—broke down and burnt out. The next area we must tend to in a busy season is our soul which is comprised of our mind, will, and emotions. The soul is another component of our internal landscape that can go haywire when untended. In busy seasons, negativity can creep in, stress can intensify, and everything can feel dark and heavy. In this place, it is difficult to see the good things that are happening, and things can begin to feel hopeless. I want to assure you that things don’t have to get this bad! Don’t forget that you are responsible for your thought life! When you start to feel anxiety and overwhelm washing over you, it is important to acknowledge what you are feeling and what is happening in your life. You just don’t want to get stuck there. There have been clinical studies that have proven the intense mental and emotional health benefits of journaling and writing down things that we are thankful for. As usual, God’s Word is way ahead of ​the world's best research! Examining our thoughts and practicing gratitude may sound like a luxury that could only be utilized on a spiritual retreat in the mountains, but that is not the case. Take some time either in the morning, after work or before bed to write down a few thoughts about how your feeling. Be sure to get out anything upsetting or sad on paper. Writing will begin to clear out icky thoughts and emotions instead of letting them sit and fester inside. Don’t end on the negative though. Think about any positive scriptures or Bible promises that could address your situation. Consider what God would say to encourage you regarding ​the challenges that are happening in your life. If you’re not sure what He would say try doing an internet search using a phrase like “Bible verses for discouragement & anger” or any key words that apply to your situation. After you have meditated on some positive Bible verses, list at least 3 things you are thankful for and you will be amazed at how much better you will feel over time! Many times a marked improvement in mood and outlook is immediate, but don’t be discouraged if it takes time to begin transforming your thoughts and improving your mood—the work you put in will be well worth it. During times when personal and professional responsibilities are piling up, we must choose our mindset and be sure to think about what were thinking about! Need help keeping a positive mindset & staying encouraged in the Lord? 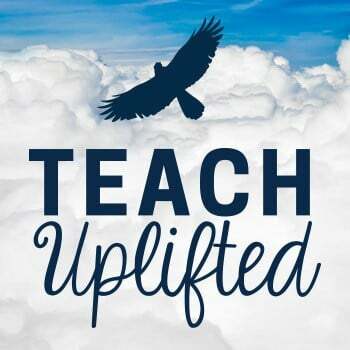 Join us in Teach Uplifted to discover how to teach with His joy & peace - even when everything is going wrong. Right off the bat, I’m going to admit that taking care of our body is tough. We live in an era of convenient, addictive, emotionally comforting food that is cheap. Does that sound like a teacher temptation or what? As a teacher, sometimes it can feel like the promise of ​end-of-day donuts and a caramel macchiato are the only things keeping us going. I get it! In spite of this, most of us know the health basics: drink plenty of water; ​avoid super sugary sweets; ​steer clear of junk food, and cut back on fast food. Oh and don’t forget to sleep for a minimum of 7-9 hours! That’s not to mention the 10 million diet plans out there that feel a bit contradictory and confusing. Don’t beat yourself up if you haven’t been taking care of your body like you know you should. Condemning ourselves makes it harder to treat our bodies well not easier. I won’t attempt to give a health lesson here because there are so many amazing resources ​and books on health. If you want a good place to start with a faith based focus I recommend The Daniel Plan from Saddleback Church. I do however want to narrow things down and give you one challenge that can literally change your life. This one aspect of health has benefits that will relieve stress, boost endorphins (happy brain hormones) and contribute to your strength and overall sense of vitality. In my life I have definitely struggled to stay healthy, but when I am exercising regularly, I feel so much better, and I think you will too! The most important step to creating an exercise habit is to find out what type of workout you enjoy best. If you don’t already know, there are several ways to find out. Most libraries have workout videos you can rent, and you can try several different ones that seem interesting. Youtube also has tons of free workout channels like BeFit with free workouts which can give you a great sample of what form of exercise you might like. Of course the type of exercise you choose can be as simple as going for a daily walk around your neighborhood, going to a workout class at the gym, or jogging on the treadmill. Your workout does not need to be fancy—just consistent to see and feel results. Would you believe that 1 hour a day could change your life? Recently I learned about the concept of the Power Hour. I have no idea who started the concept, but it seems like everyone from ministers to business executives are talking about this! Normally Power Hours are divided up into 3 (20 minute) blocks preferably back to back, although they could be spread throughout the day. I have seen many different breakdowns, but the one I would recommend is 20 minutes to workout, 20 minutes to read the Bible and pray and 20 minutes to journal your feelings and write ​3 things your thankful for! Normally it is recommended that you do your power hour in the morning so that you start your day right and get the most important things taken care of before you attend to your responsibilities. However, if you're not a morning person or if you need to break your 20 minute blocks up over the span of the day, that works too! The main idea is to figure out how you can begin incorporating simple habits into your day regularly. These habits will add up over time to build a reservoir of strength, joy and vitality: spiritually, mentally and physically. If starting with an hour seems like too much, I want to challenge you to start with 20 minutes a day and pick one of the things from this article to practice daily. Get a calendar, and see if you can keep your new habit going for at least 21 days! Although you may not have any lavish beach vacations coming in the near future, putting in daily habits to care for yourself will be a daily vacation for your body, soul and spirit! I needed this today and I just said to my husband that our couple devotional time needs to be more intentional and done at a specified time of day that is protected from distractions. We are needing wisdom about several decisions that we are needing to make within a short amount of time.